The 39th foundation day of the Peoples’ Party of Arunachal (PPA) Celebrated in Itanagar on Sunday. 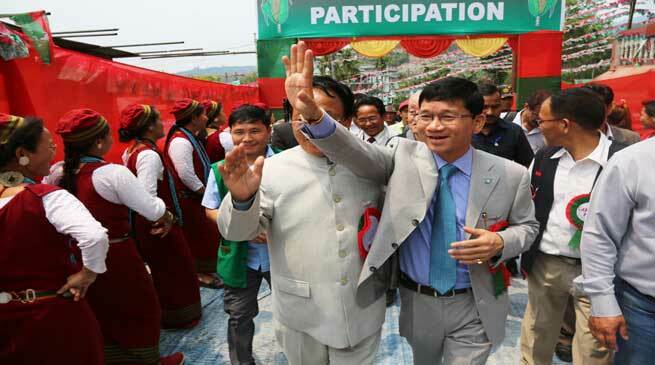 Chief Minister Kalikho Pul also took part in the Celebration. Speaking on the occasion, the Pul said that the party founder late Bakin Pertin and late Tomo Riba were great source of inspiration who wanted Arunachal to be self sufficient in every aspect. He, however, regretted that their vision couldn’t be realised and the state is still dependent on central government’s dole. CM Expressed about his recent visit to Aalo, which he mentioned as well developed town with highly qualified inhabitants. Yet the basic facilities in schools, colleges and hospitals were in shambles that reflects our mindset, he remarked. The CM expressed deep appreciation for people behind the making of the PPA’s flag song, which was sung earlier. He said every word in the song is inspiring and meaningful and added that songs have been very popular in mobilising the people. If we are to truly take every word of the song deeply in our heart, and with such motivation, Arunachal could truly be a very peaceful and progressive state, he observed. Speaking on the weakening of traditional systems, the CM said the people were never short of food grains earlier; but after the arrival of PDS system of food distribution, we hear of shortages everywhere. So this is a time to revisit the vision and values of the founding fathers of PPA, who wanted Arunachal to develop along the lines of their own genius, he said and added that the idea of federalism is very much reflected in the vision of Prime Minister Narendra Modi, who wants to give more flexibility to the states in terms of managing its resources. Appealing the people to cooperate on development, he urged for a need based development and not based on class, community and creed. He said if people desires to see Arunachal as a developed state like Sikkim, then they have to make way for development and not create hurdles. The CM further said there would be no discrimination to any constituencies and revealed that funds are being sanctioned to all places as per the work completion report. He also appealed the people to keep the spirit of work and to focus on their actions and not let the fruits be purpose of their action. On Chakma and Hajong refugees in the state, the CM said the government was not in position to take back their state’s citizenship but assured it would take steps to prevent their encroachment and would confined them to their original settlement areas with clear boundary demarcations.